On Feb. 24, Amy Goscha, of Goscha Law Firm, and Honorable Judge Daniel Taubman, of the Colorado Court of Appeals, presented âEthical Considerations to Integrating Unbundled Legal Servicesâ at the Continental Divide Board Association Meeting held in Frisco. The Continental Divide Bar Association has members from Eagle County, Summit County, Clear Creek County and Lake County. Unbundled Legal Services allows individuals to hire an attorney as a consultant and have access to legal advice without paying a large upfront retainer. Goscha and Judge Taubman explained how this model is an ethical and safe option that lawyers can offer to litigants in our community. If you would like to learn more about Unbundled Legal Services, please visit www.goschalaw.com/unbundled-legal-services.html or call 970-446-6327. 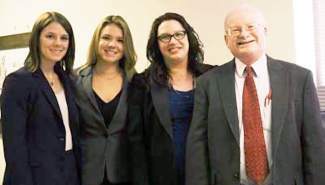 Pictured left to right are Amy Goscha, Danae Woody, Angela Roff and Judge Daniel Taubman.